Jio Phone 2 Info, How to Buy? HomeJio Phone 2 Info, How to Buy? Hello Friends, Last time, Xiao launched its first effective Freephone Geo Phone which you could buy by paying 1500 rupees and this 1500 was promised to return it to you after three years. I believe that many of you will also be buying it and if you do not know much about it, then you can read this post below, which gives full information about Xiao phone. Now Xiao has launched a new phone called Jio Phone 2 which will be given full information in this post about what you will get in this phone, what is the price of Jio Phone 2, Jio Phone 2 Questions, etc. I will answer all of you on these questions of Geo Phone 2. *What is the price of Jio Phone 2? *Where will I get Jio Phone 2 and when will I get it? *What's the new offer with Jio Phone 2? Xiao has again launched a stealthy product on July 5, 2018 and this product is Jio Phone 2. Jio Phone 2 In many ways, Geo is better than a phone but at the same time, the price of Jio Phone 2 is more than the phone itself. 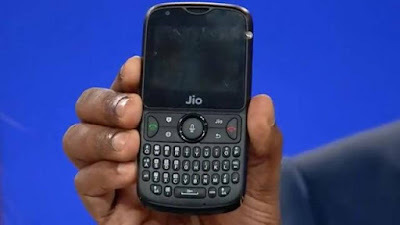 Reliance Jiao announced in his AGM that soon Jiao Phone 2 is coming for all the users, which will be available only for customers of Jiao Phone subscribers, which will be available only for Rs 501, which is named as Geo Phone Monsoon Crowd Offer. Apart from this, Mukesh Ambani also announced that soon Jiao Phone users will get the gift of three big apps YouTube, Facebook and WhatsApp. With this, he also told that soon the Whatsapp app will be released for the phone. That is, you will now be able to run Whatsapp quite easily in your live phone too. Describing Geo Phone 2, it was said that you will find a bigger keyboard, 4g support, 2.4 Inch display, 2000 mAh battery, 512 MB of RAM and 4GB storage which can be extended upto 128 GB. Let us tell you that the sale of the phone will begin on August 15, 2018 and after that you will be able to buy it only for Rs 501 if you already have a phone call. Apart from this, customers will be able to take advantage of the Jio Phone Monsoon Hungama offer from July 21, which has been given full information about this. Let us tell you that Geo Phone 2 will not stop selling Jiao Phone 2, Zoose phone and Geo Phone 2 will continue to sell in the Walke Market. The phone has a 2 megapixel rear and 0.3 megapixel front camera which is right according to the price. You will find VOLETE and VOY-Fi ie voice over Wi-Fi in Xiao phone 2 Apart from this, features like FM, Wi-Fi, GPS and NFC will also be available in the phone. Combining this phone is really good with the previous phone and this is the reason that its price has been kept more than the previous one. Now you want to know what is the price of live phone 2? What Is Price Of Jio Phone 2? Let me tell you the actual price of live phone 2 is 2999 but you can buy it only for Rs 501 if you already have a phone call. For this, you have to return your old phone phone and will have to pay Rs 501 and you will be able to buy Jio phone 2 at such a low price. But if you do not already have a phone, then you have to pay the full amount of Rs 2999. Where will I get Jio Phone 2 and when will I get it? You can buy Geo Phone 2 offline from any Geo Store offline since August 15, or you can visit its website at Jio.Com to buy it online. You can buy this phone through both, but for this, you have to wait till 15 August 2018. What's the new offer with Jio Phone 2? By the way, all the old offers of Jiao will also be available on this phone, but Jiao has now taken a new offer called Jio Phone Monsoon Hungama Offer through which this phone is being offered to you only Rs 501. More detailed information about this will be updated soon to see how you can take advantage of it. The best feature of this phone can be that this phone has a big keyboard that will be easy for typing as you can do in BlackBerry Phone. What is the difference between Jio Phone and Xiao Phone 2? 1) First of all there is a great difference in the price of both. The price of Geo Phone 2 is twice as big as the phone. Yes, the phone price of Xiao phone was only Rs 1500 but the price of live phone 2 is Rs 2,999. However, under monsoon ruckus offer, you can buy Geo Phone 2 for Rs 501 if you already have a live phone. 2) Talk about the design of both phones, both phones have a 2.4 inch QVGA display. The normal number pad has been given in Xiao phone while the QWERTY keypad is given in Jio Phone 2. 3) Geo Phone used to support Single SIM but Geo Phone 2 would support Double SIM, though it is not yet confirmed that Jio will support second SIM only in Phone 2 or other telecom company. Both phones have 4G VoLTE, FM radio, Bluetooth, GPS and Wi-Fi features. In Geo Phone 2 you will also be able to access Facebook, YouTube and Whatsapp, the app was not available in the live Jiao Phone phone. 4) Talking about RAM and processor, both phones have been given 512 MB of RAM and 4 GB internal memory. Talking about the battery, both phones have a 2,000 mAh battery. Both phones run on KaiOS The camera also has a 2 megapixel rear camera in both. What is Recharge Offer for Jio Phones? Now if you keep a live phone then you get a lot of recharge offers in it, in which you can enjoy more in less money. I am sharing the list of those plans with you all so that you can also take advantage of it. There are currently two active plans and both are quite cheap.